Day 154 Gothenburg to Kungshamm, Gotland, Sweden. This morning we made our way back into Gothenburg. I can’t understand why I get myself so stressed about getting my hair cut in unfamiliar places, but I do. This time, the girl was very pleasant and thankfully spoke perfect English. She was, however, less than complimentary about the colour of my hair. ‘Who did that?, she enquired. ‘My husband, on a ferry to Iceland’, I replied. There were a few moments of silence, and then she resolved to do something about ‘the unnaturally blonde colour’ he had applied. I must admit, I had grown rather fond of it. But she was having none of it – apparently, it didn’t match my eyebrows! So an hour later, the gunk has been applied, and she is now washing it off. She positioned the wash-bowl in such a way that it felt as if she was breaking my neck. She then proceeded to massage my scalp. If there’s one thing I can’t abide, it’s hairdresser’s taking on this off masseuse role. She clearly couldn’t work out why I was so tense. ‘You’re hurting my neck’, I eventually volunteered. She then stopped this unnecessary ritual, and finished washing my hair. Howard arrived back just in time to watch the final flourish of the cutting. ‘What do you think?’, I asked. ‘Mmmh’, he replied. Why are men always so ambivalent? Frankly, my eyes watered at the price, but I guess we knew that anything in Sweden was going to be expensive. Next time, I might just revert back to my handy trainee hairdresser in his boxers – much more fun! Hair done, and repaired computer collected, we headed out of Gothenburg, and along the north coast of Gotland. We are staying on a very pleasant campsite on the coast, near a little harbour and marina. There seem to be a lot of little holiday cabins along this part of the coast – apparently the Swedes are keen on summer houses. The pitches on the site are large, on a series of large grass fields. We parked Oscar as far away from the other tents and Big Whites as we could. In the same area as us though. 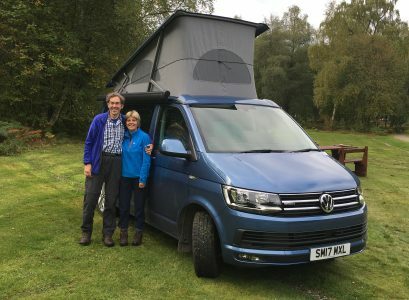 is a German couple in a large white motorhome. They seem very organised, with washing lines, furniture covers, bike covers, barbecues – the lot. As we sat outside in the sun having a cup of tea, the chap was cooking his barbecue. At this point, his mobile rang, and he answered it. Although being forty yards away from us, his loud voice boomed across the camping ground. It was clearly a business call. He explained that he was doing a lot of travelling for work just now. A little later he complained that he was really very busy, and wasn’t sure if he would have the time! Howard and I were in fits of giggles. He clearly didn’t want to let on that he was away on holiday in his motorhome, cooking his barbecue. Slight frustration became apparent in his voice, as his food became cooked, and he ended the call abruptly by asking the caller to email him more information. I know eavesdropping is wrong, but it was really hard not to hear the entire conversation, and it certainly amused us! We ended the day with a lovely walk after tea down to the harbour. No plans for tomorrow yet – we’ll take the day as it comes. Yet again the iCloud gremlin has gobbled up my photos, but the ones from yesterday in Gothenburg have finally appeared, so I’ll post those in yesterday’s blog, if anyone’s interested. Previous Post Day 153 Gothenburg, Sweden. Next Post Day 155 Kungsmann, Gotland, Sweden. Yes please i want to see the new hair do!